We've got 12,000 closed beta codes for Square Enix's brawler to give away for the Sony America store – so act fast! All the keys are now gone but if you haven't already redeemed your key, act fast as the Dissidia: Final Fantasy NT closed beta kicks off on Friday Aug 25 at 9pm PT and finishes on September 3 at 9pm PT. 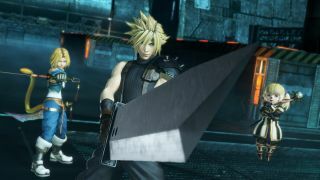 Square Enix's promising 3 vs 3 brawler is out in early 2018 – don't miss our Dissidia: Final Fantasy NT hands-on preview to see why we're calling it 'Final Fantasy's version of Smash Bros' – and the good news is that you'll be able to play it even sooner. We've got 12,000 keys to give away for the PS4 closed beta later this year, with dates to follow shortly. All you have to do is enter your email address and follow the simple steps below to get your code to redeem on the Square Enix site. Two points, the keys are for the Sony America store only - so for NA and LATAM regions - and you won't need to have a PS Plus membership to play.